Hey, look at this, we’re timely this week! All of the comics reviewed are for sale at your shop today… TODAY! Go get ’em, folks! Lately, stuff like “work” and “real life” have been getting in the way of me devoting enough time and energy to comic books. Sadly, I have no idea what’s in the works in the coming months, outside of my regular titles. Thankfully, Unwinnable’s stalwart Ian Gonzales is always in the know, and he hipped me the Tarzan on the Planet of the Apes. Here’s a crossover that is as surprising as the Star Trek/Planet of the Apes crossover from 2015. Yet both make just as much sense when you think about it. I’ll admit to only a cursory knowledge of the mythos of Tarzan, but the idea of him being somehow involved with our favorite ape planet is more than intriguing. So the brains behind Dark Horse and BOOM! Studios teamed up to bring us a Tarzan on the Planet of the Apes mini series. And for my fellow cynics, psst… new Tarzan film released in 2016. Seeing that co-writers Tim Seely (Hack/Slash, Grayson) and my current favorite comic writer, David Walker (Power Man and Iron Fist, Shaft) are helming the script should reassure comic fans that we are in good hands. I have no real reason to doubt the quality of our unfolding story, as BOOM! Studios has shown themselves to be good stewards of the Planet of the Apes extended universe. However, my patented “cynic-o-meter” noticed a curious thing about the two publishing houses teaming up. 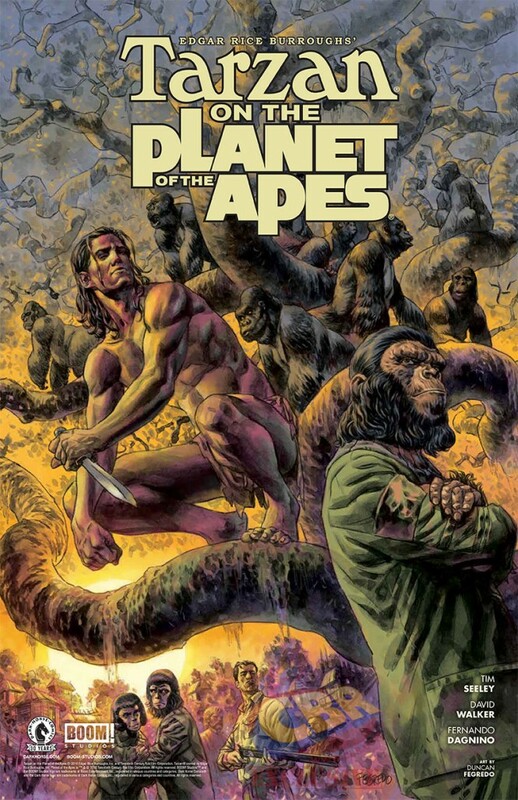 The Dark Horse web site promotes Tarzan on the Planet of the Apes but not the BOOM! Studios site. I noticed the same thing when Star Trek/Planet of the Apes: The Primate Directive was released: IDW’s site promoted it, but BOOM! didn’t. BOOM! Studios handles the Planet of the Apes brand, as they’ve released press stating they have “a unique first-look feature film relationship with 20th Century Fox” but I don’t see why they aren’t sharing in the promotion of a property in which they have an interest. Enough of the quibbling – on to the fun! Issue #1 jumps between and 1901 and 2016. In the time line of Planet of the Apes universe, we’re around the Escape from the Planet of the Apes film, as Cornelius and Zira are more or less in our time. Cornelius’ scientific curiosity is piqued, but Zira (a scientist, but also a pragmatist) is concerned after the refugees’ own time traveling adventures. Zira provides some exposition to orient ourselves in the squirrelly time line. Members of the Mangani tribe, led by Kerchak, stumble across some hunters who are out for big game. Kerchak is caught and in his rage, reveals to the men that he can speak. Tarzan spies the unfortunate goings-on and lashes out, only to be captured. Cornelius and Milo suffer a similar fate. Smash-jump to North America in 2016 and a Tarzan-like man is doing battle with ape soldiers. He is captured, and when the name Zira is mentioned, he demands to see her. I’m hooked for the entire ride. The artistic team of Fernando Dagnino (art,) Sandra Molina (colors) and Duncan Fegredo (cover) have done a beautiful job. They are entirely complimentary of one another. Dagnino captures facial expressions of both man and ape quite well. Molina’s muted palette captures the feel of the original Planet of the Apes film series, and her nighttime scenes have just the right amount of brightness and shade. While I’m very excited to see what comes next, I am also happy that Tarzan on the Planet of the Apes is a mini series. This should ensure tight storytelling and high quality visuals throughout. The Planet of the Apes universe is ripe for riffing on the “what if’s” dedicated fans ponder of all their favorite fictions, and Dark Horse and BOOM! Studios have found the right creative team to tell this tale. 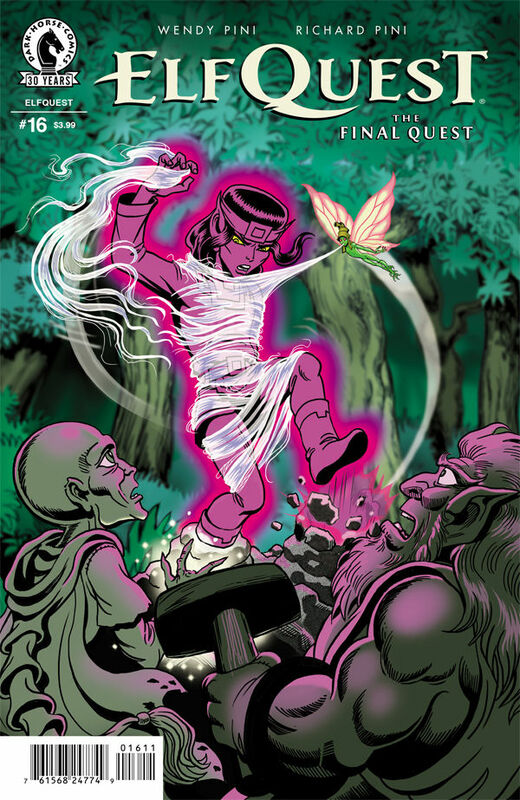 My last review of ElfQuest: The Final Quest focused on a bird’s-eye view of the larger themes of the series so far – and when you’re talking about a fantasy comic that has various iterations dating back to the seventies, you’re talking about a series that runs deep – so I didn’t get a chance to hone in on any of the parts that make EQ such a complex whole. That’s partly because the Pinis have such steady hands on the wheel, especially with Wendy pulling double duty with story and art. She’s very nearly an auteur creator, but she’s got strong support backing her up. All this is to say I can’t believe I made no mention of Sonny Strait’s incredible color work! Fortunately, the latest issue’s focus on Rayek (and thus, the evil spirit Winnowill), gives me plenty of opportunity to heap praise on Strait’s deserving shoulders. 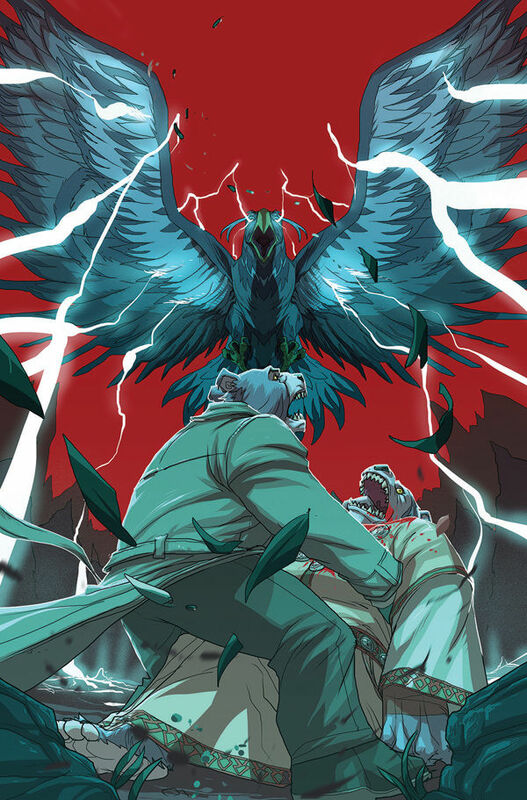 As is the EQ: The Final Quest way, issue #16 begins right where #15 left off, with Ekuar, Two-Edge, and Petalwing struggling to keep Rayek’s anger towards the encroaching humans in check, lest he lose his tenuous control over Winnowill’s spirit, which is imprisoned inside him. Meanwhile, at the Palace, Rayek’s daughter Venka pleads for a measured response to the gathering war men. We briefly check in with with Cutter and his heart circle to see him start to regain his memory, and to learn just a bit more about the wood-elves and the singing stranger Dre-ahn. Next, a spectacular battle at sea brings an enraged, and later, critically injured Rayek nearer our little band of Wavedancers, who end up administering healing that goes much deeper than flesh and bone. Along the way, we learn just how related all of the elves are: the tree-shaped wood-elves are somehow related to Savah, and perhaps it was only the hazy side-effect of a fever dream, but Rayek’s recognition of Ekuar’s features in Salt’s face threw me for a loop. The resemblance really is uncanny. Back to Strait’s colors: the opening scene with Rayek takes place in front of a fiery orange sky, with Winnowill’s essence represented in vibrant purples and reds. The scene in the Palace shifts to softer pinks and yellows, the third scene in the woods is all dusky blues, which then give way to grey clouds and inky black waves as Rayek begins his fight with the human sailors. The span and spectrum of a single sunset is represented in these pages, even if the settings are all over the world of Two Moons. He stretches his muscles further during the scenes at sea, with the flashes of cannon blasts and Winnowill’s spirit popping against all those dark colors. As her spirit gets closer to the chance to escape its bodily prison, her essence physically pulls farther away from Rayek, filling the frames with angry color. A particularly spectacular page takes place almost entirely in the psychic space, with Winnowill and Reef reuniting for the first time since she tortured his healing power away. It’s white vs. black and cool blue vs. hot pink, until eventually they all begin to blend together, right at the moment compassion breeds forgiveness. Like I said, this series runs deep. The issue ends with the requisite cliffhanger: Cutter’s newly-regained focus is pulled towards the key hidden in the grip of New Moon, the sword he inherited from his father. With masterful work like Strait’s colors, the Pinis’ writing, and Wendy’s art, there’s no question I’ll be back to find out why. The more I read Cryptocracy the more it reads like the third arc/act of a more traditional story. It’s the one where all of the established systems come crashing down. It’s the one where our heroes question the fabric of what they know and the whole landscape is about to change. Where their values, friendships, and methods are tested beyond anything before. I can’t stop thinking that’s where Cryptocracy belongs. Here we are at issue #4 and I’m wondering who I’m supposed to be following, sympathizing with, or generally caring about. We hardly got one issue of “normal” before Hum showed up and started throwing rocks through the pretty windows of the Nine Families. By this issue, prophecies are already jumping the gun. The Sixth Prophecy which promises that that which goes bump in the is going to come back for the humans that penned them up, hard. But what about the other prophecies? Honestly, if it wasn’t for Grahame calling out the prophecy as he heard it I might not have even noticed someone quoted it verbatim. And that’s kind of the trouble with Cryptocracy, it assumes a longstanding history. Perhaps what worked best for Geoff John’s “Blackest Night.” It had its origins in an old Alan Moore story, it touched on the oath very Lantern must recite. Cryptocracy wants to do away with the myth building and just get down and dirty with the part where it gets good. The result is a bit muddled. I want to care about Grahame and his bear friend and feel the threat of Hum but I don’t get why the stakes are so high. The Families sound awful. A world bereft of their machinations and hidden agendas sounds like a pretty good deal. Why shouldn’t I be rooting for Bela and her massive data crash? Maybe all of that will be explained but I feel as though in your fifth issue or later is sort of late in the game to be implicating my feelings in a story. I love a good conspiracy, I want to buy in. But I need a reason to do that. If it sounds like my good will towards this series is waning, it’s because it is. I’m happy to stick with a slow burner for a while but lots of things happen in Cryptocracy, particularly this issue, without being impactful. The premise is wonderful but the execution feels more like a brilliant Roland Emerich film than anything Chris Carter did.